Beachfront living at its finest! Imagine an invigorating morning swim or lazy evening dip then meandering back through the dunes for an alfresco shower at your own private beachfront paradise - now realise that dream. Built onto the sand, this vision of striking design delivers an exemplary beachfront lifestyle overlooking gorgeous turquoise waters for you and your family. Set within a boutique group, this fabulous home opens to reveal a breathtaking double height foyer with a sweeping timber staircase drawing you up to the stunning entertaining zone. Designed to capture the far-reaching views around the bay, the incredible area upstairs, boasts a gas fireplace and space to unwind, dine and entertain spilling seamlessly to a generous BBQ terrace. The stone kitchen is sure to satisfy the most avid hosts with its top-quality stainless steel appliances and butlers’ pantry. The theatre room gives more options to spread out; whilst a ground floor living area opens out to the smartly landscaped courtyard and soft sands beyond. Downstairs, each of the generous bedrooms are blessed with built in storage, including the large master which also benefits from a stylish ensuite and walk through robe, the remaining rooms share an in vogue family bathroom. Just a walk to Edithvale shops and station, this brilliant proposition also includes a study/fourth bedroom, powder room, laundry, ducted heating/cooling, security and a 4 car garage. 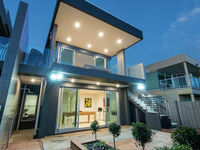 For all enquiries please contact Mark Kosch 0438 693 332 Hodges Mentone. When clients start dealing with Mark Kosch for the first time, it is not uncommon for them to comment on his clear commitment to helping people achieve the best possible results from their property dealings. It’s not a common trait nowadays, but less surprising when you realise that prior to entering the real estate industry, Mark spent over a decade in a high-tech role within the medical world, assisting people when they were at their most vulnerable and anxious. Having bought several properties over the years, both as a home and as investments, Mark understands the value of well researched, up-to-date information when making decisions about something as important as your own home. He enjoys sharing his knowledge and experience with his clients, supporting them so that they are able to make informed decisions in comfort. A keen bayside resident himself, he also enjoys sharing insights into the lifestyle that this area provides, particularly with those who are new to the area. In fact, don’t be surprised if you realise that you’ve met Mark before, either walking his dog through one of the local parks, or creating divots at one of our local golf courses. Fortunately, Mark’s advice is a lot more accurate than his tee shot, so with the Hodges team in Mentone providing you with advice and guidance, you can look forward to a result when you sell that is as rewarding as it is stress-free. One of the most important ingredients to any successful career in real estate is a genuine commitment to exceptional service. 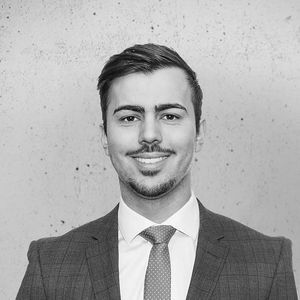 Stefan Gigovic was recruited to the Hodges team after one of our Directors gained a first-hand insight into Stefan’s outstanding service in his former retail career…which says a lot about this young man’s meteoric rise ever since. 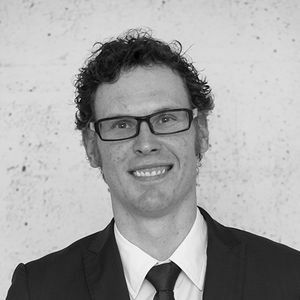 Stefan clearly thrives on the ever-changing nature of today’s real estate profession, working closely with respected local expert Jason Swift to ensure buyers and sellers enjoy a productive and enjoyable move. With Jason and Stefan on your side, your next property transaction is sure to be a positive one.